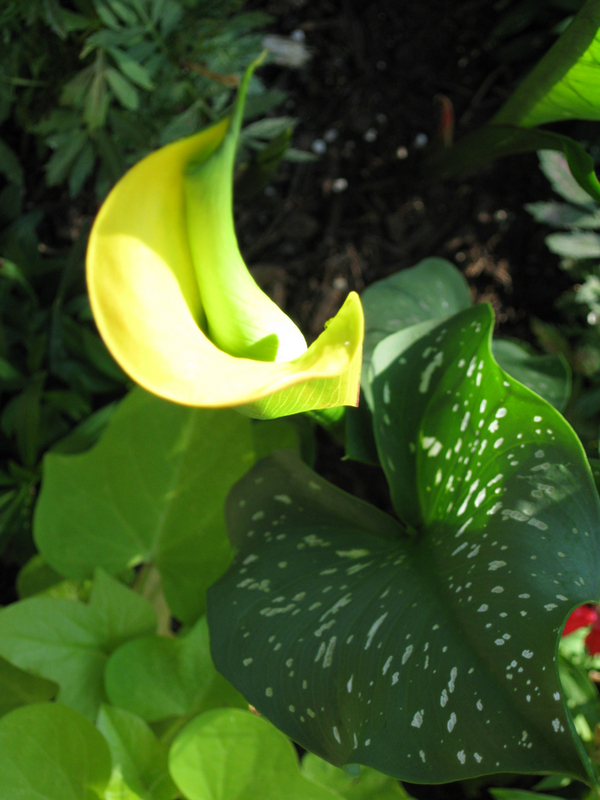 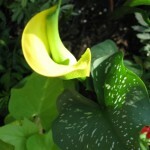 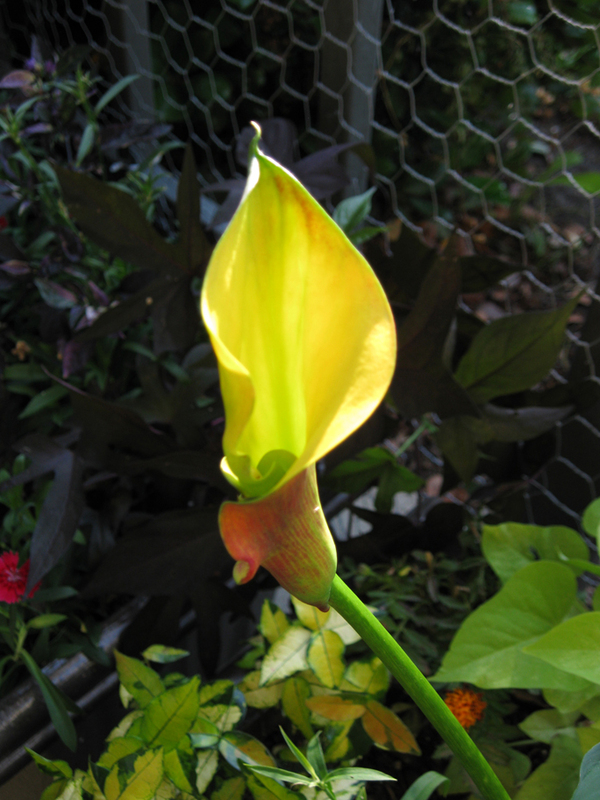 The callas are blooming. 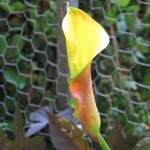 First up: Flame. 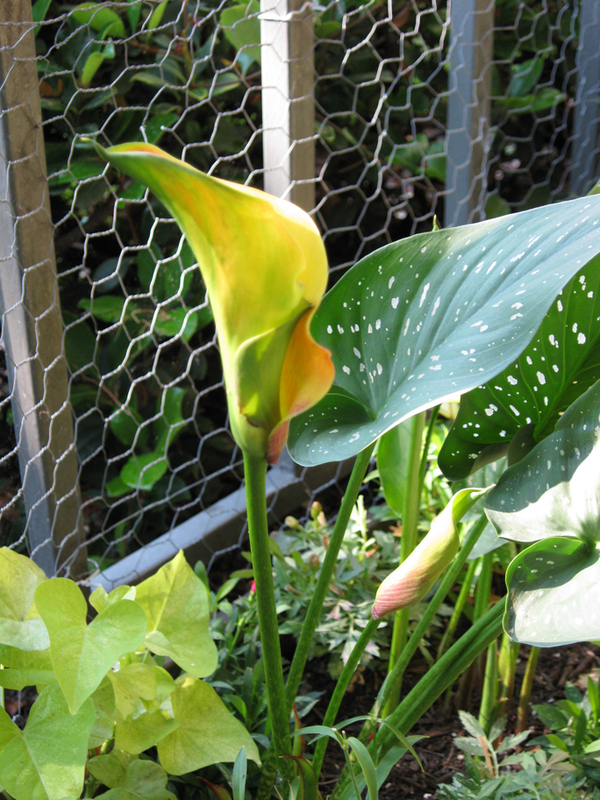 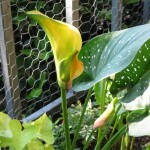 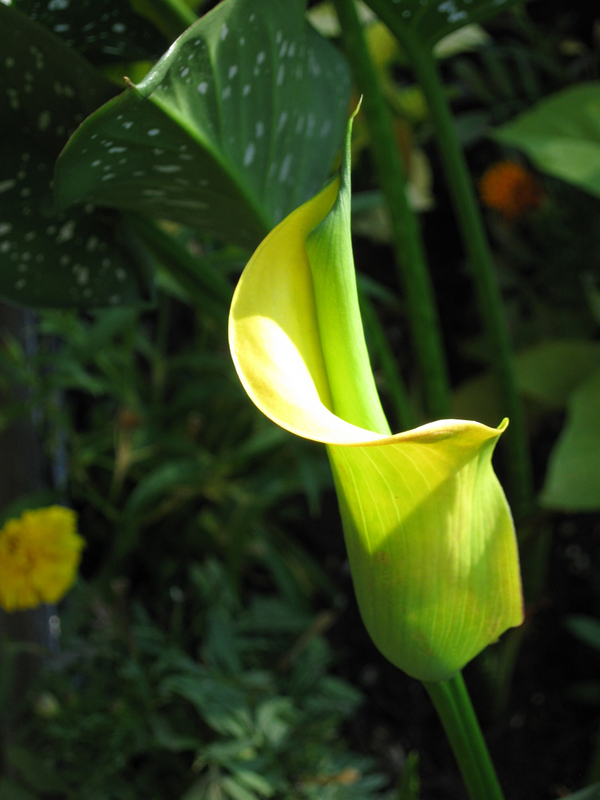 These blooms display brilliant yellow, with a touch of orange or red. 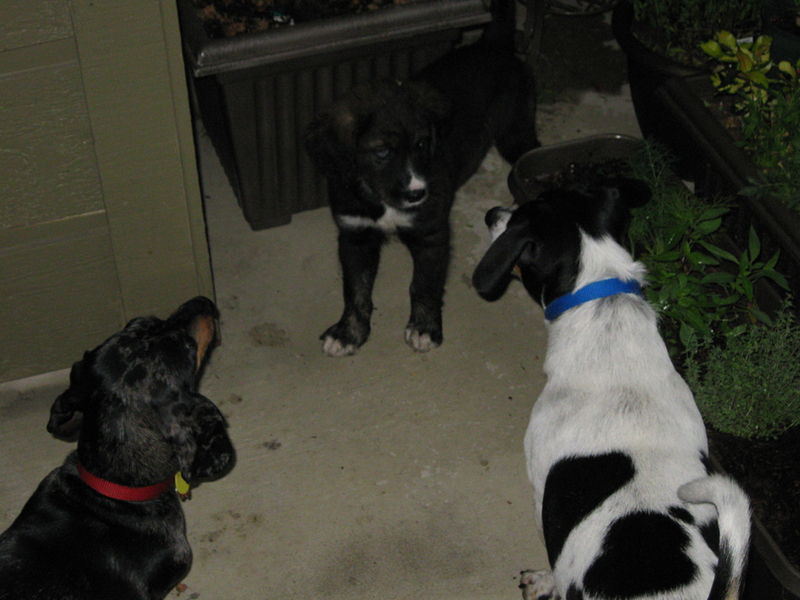 I am assuming that as the weeks go on, they will deepen in color per their namesake. 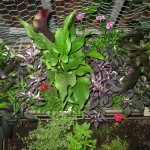 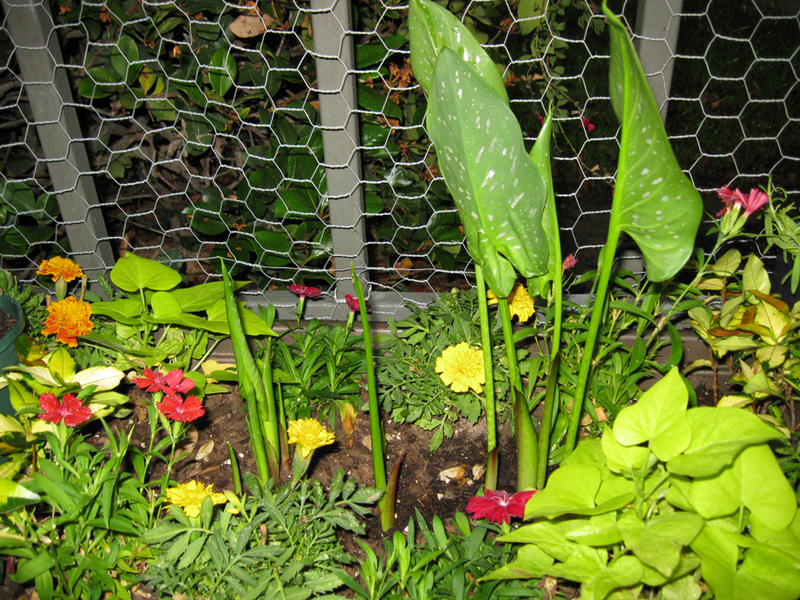 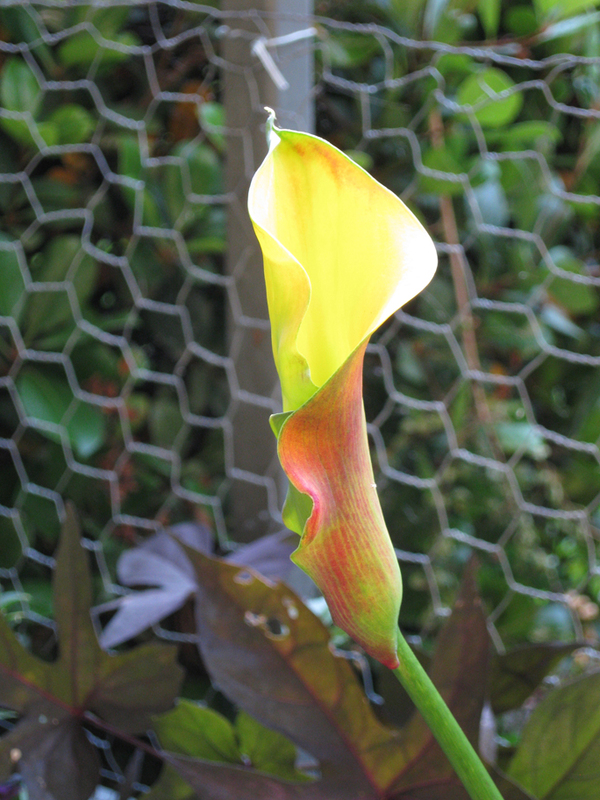 As an aside, the single blooming purple flower of my Devil’s Wine calla has barely faded but held its true shape. 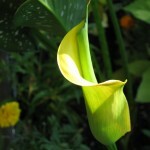 It’s a testament to how long-lived these calla blooms are! 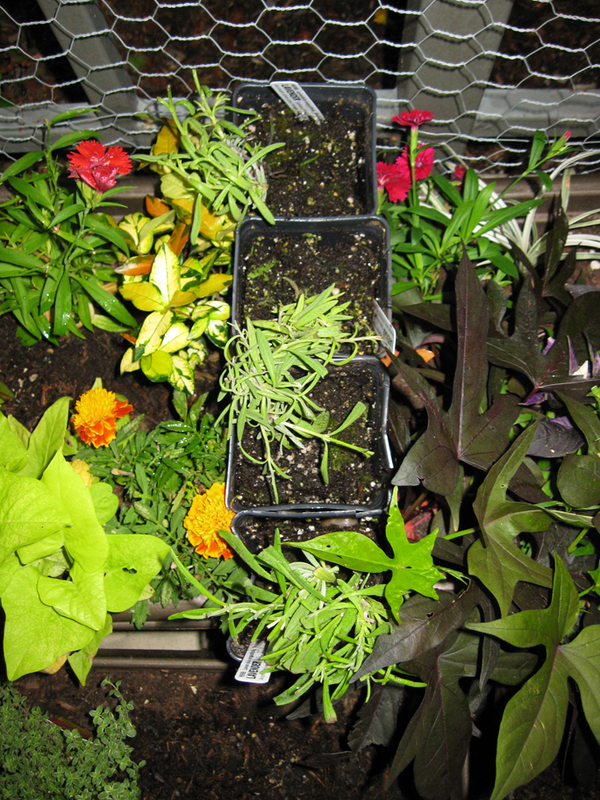 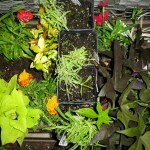 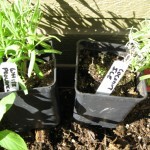 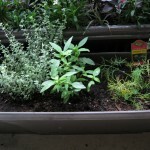 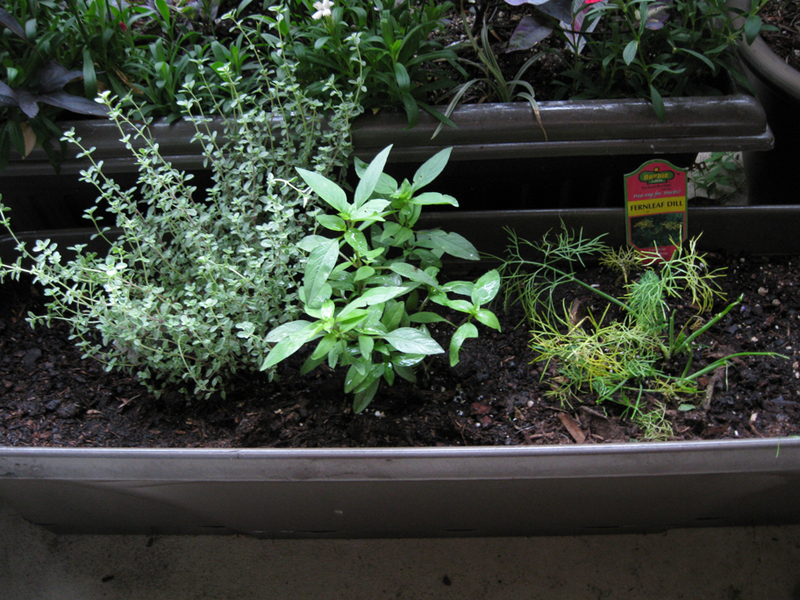 My Blossom Farm order came in last week, but 2 of the lavender plants I ordered do not appear to be faring very well. 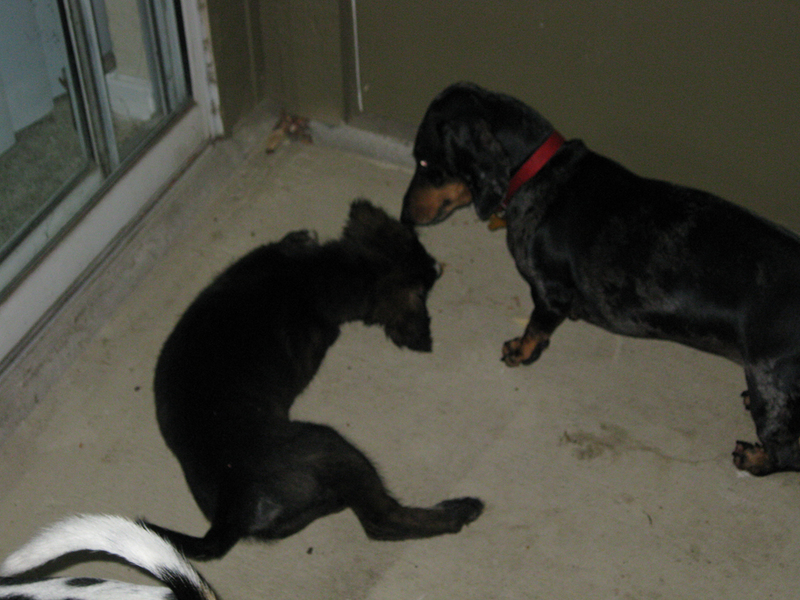 I’ve been keeping a close watch on them, but it appears the smallest of the 4 has given up the ghost. 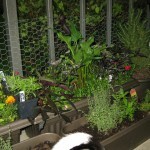 I’ve messaged Blossom Farm for assistance…perhaps they are not beyond rescue. 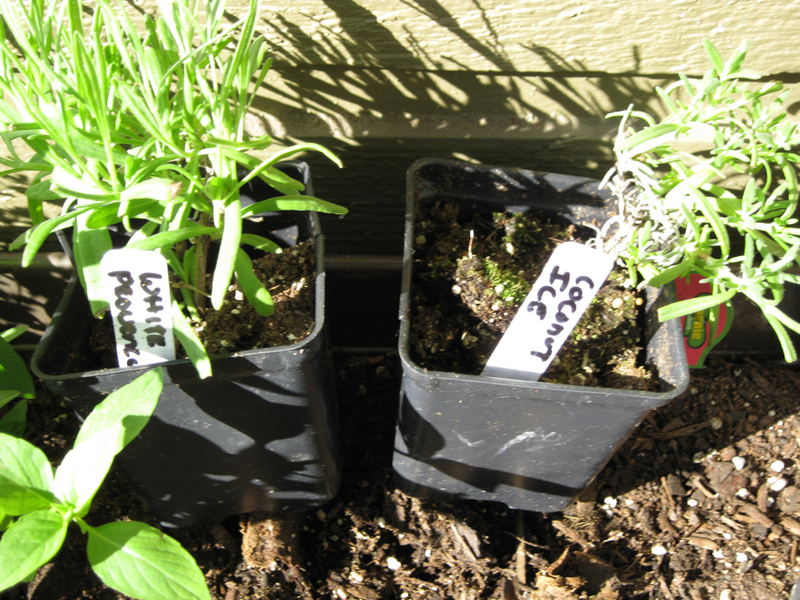 I’m just glad that I have one each of the 2 larger specimens, Coconut Ice and White Provence. 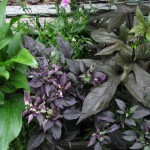 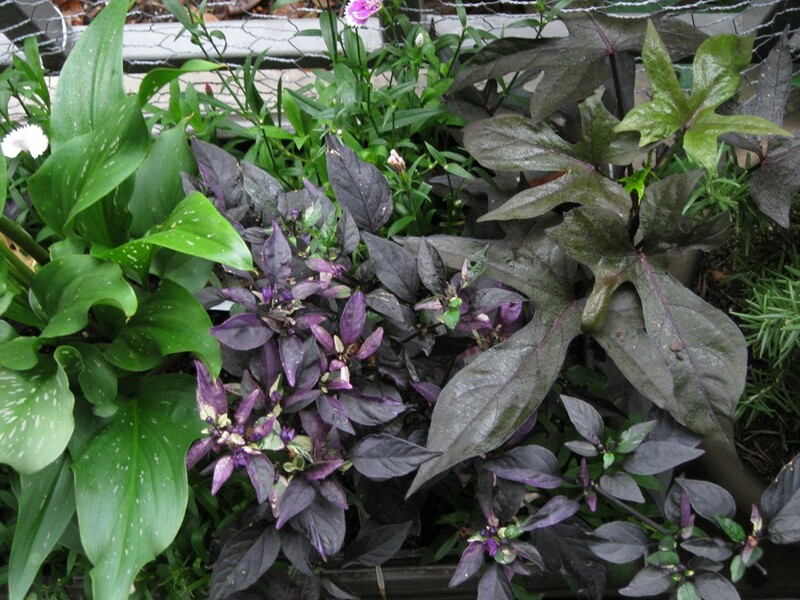 I’m not too thrilled with the Bewitched Purple potato vine (which appears to be mislabeled) threatening to take over my planter. 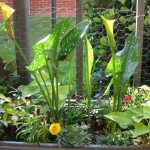 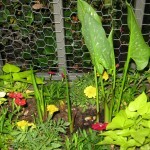 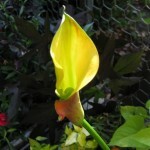 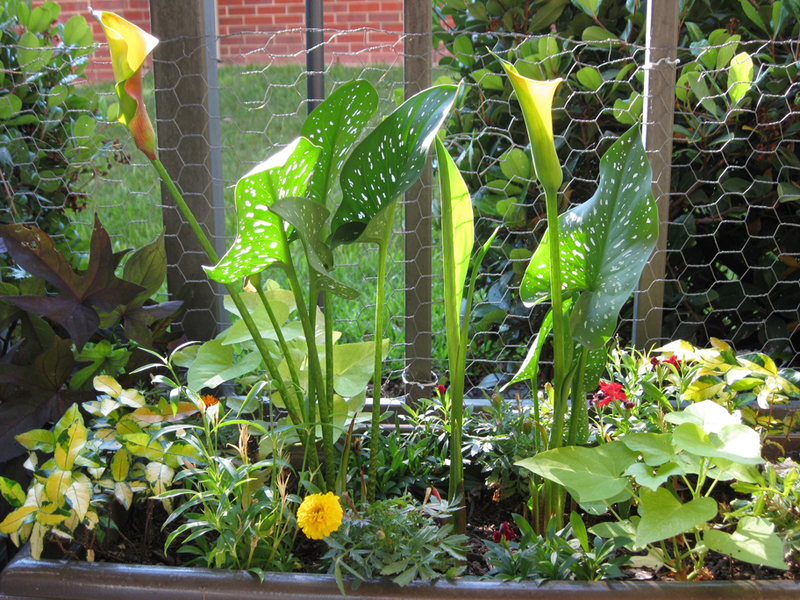 While the palmate shape of the leaves are attractive, they are much too large and overshadowing the neighboring plants. 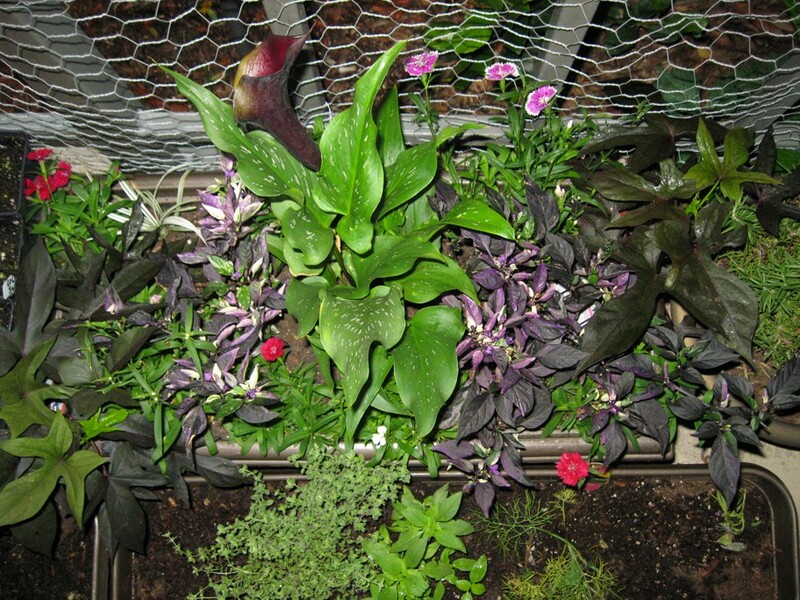 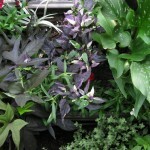 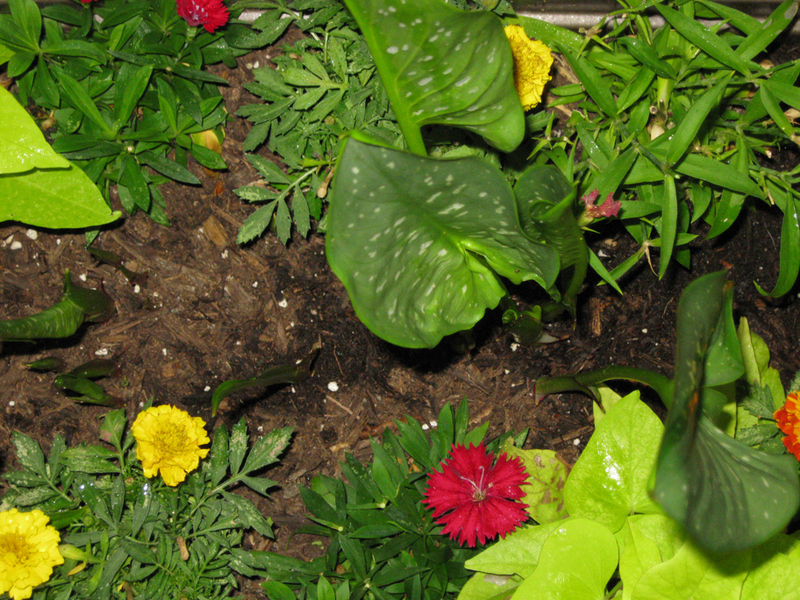 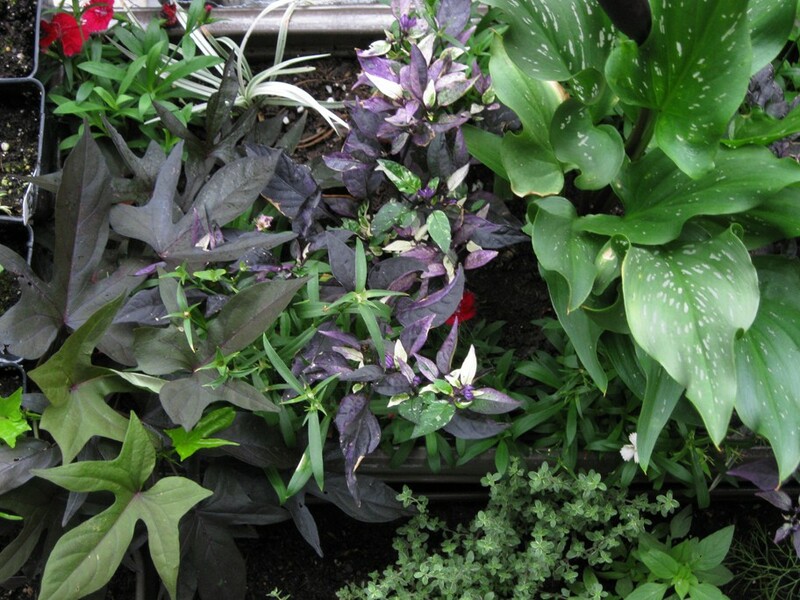 I intend to pull it out as soon as I can find a suitable replacement, preferably a petite-leaf purple potato vine, similar to the compact bright green potato vine (which may be a Sweetheart Light Green) in the other planter. 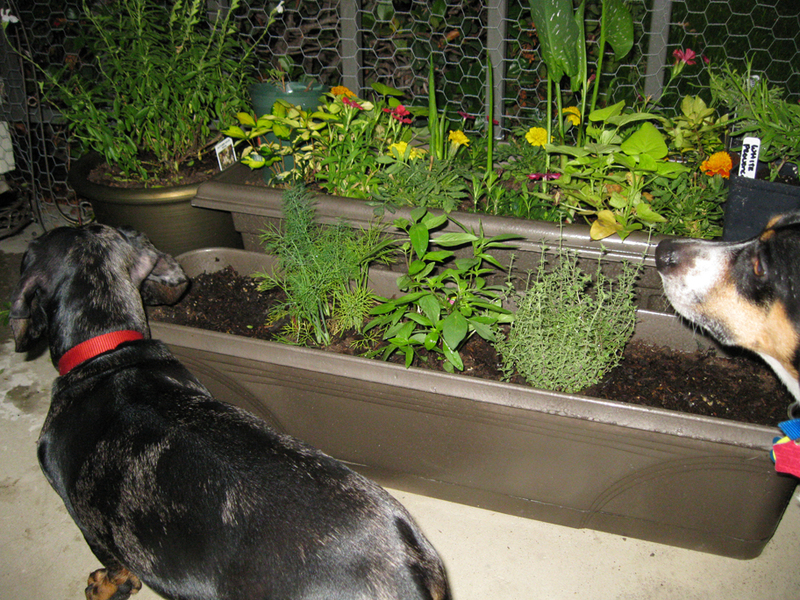 It seems my pups have a taste for dill. 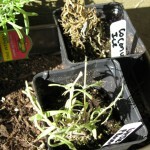 My poor dill plants have been nibbled and grazed on. 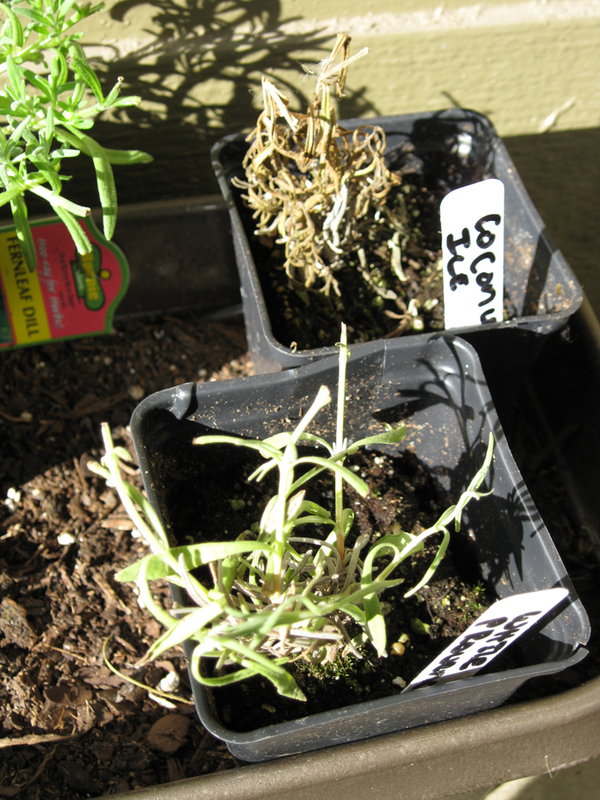 Methinks I need new dill plants. 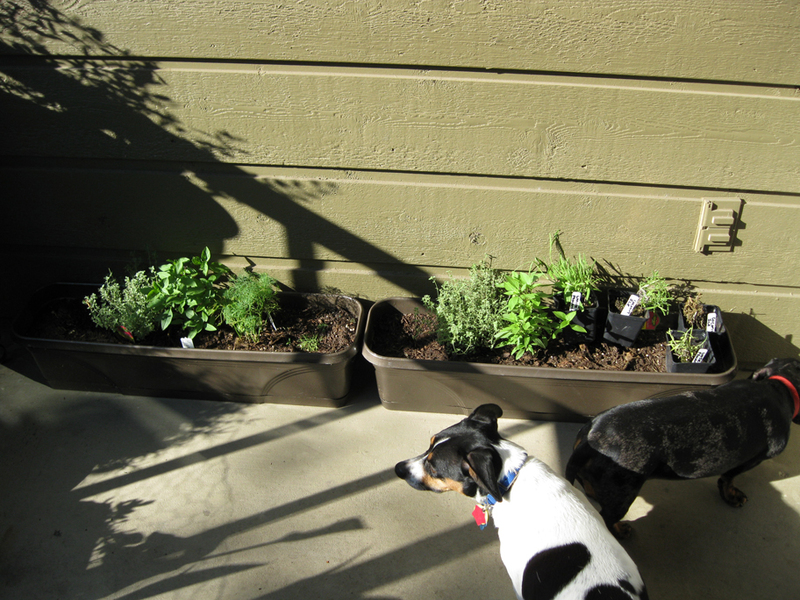 Also, my lavender plants came in last week…I managed to get them onto the patio this weekend…before the pups did any more damage to them. 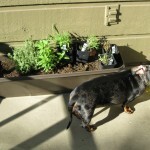 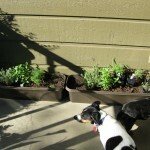 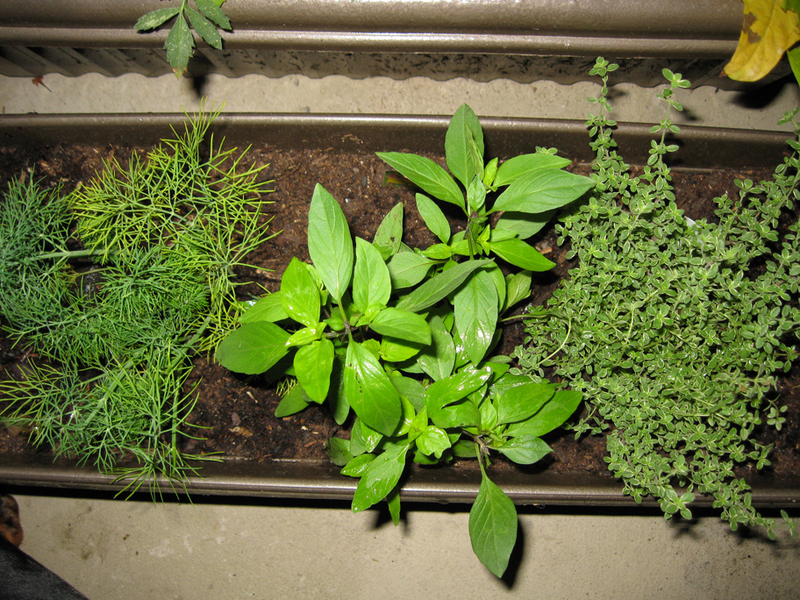 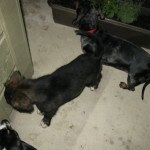 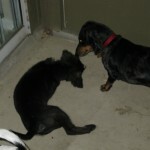 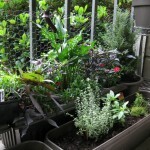 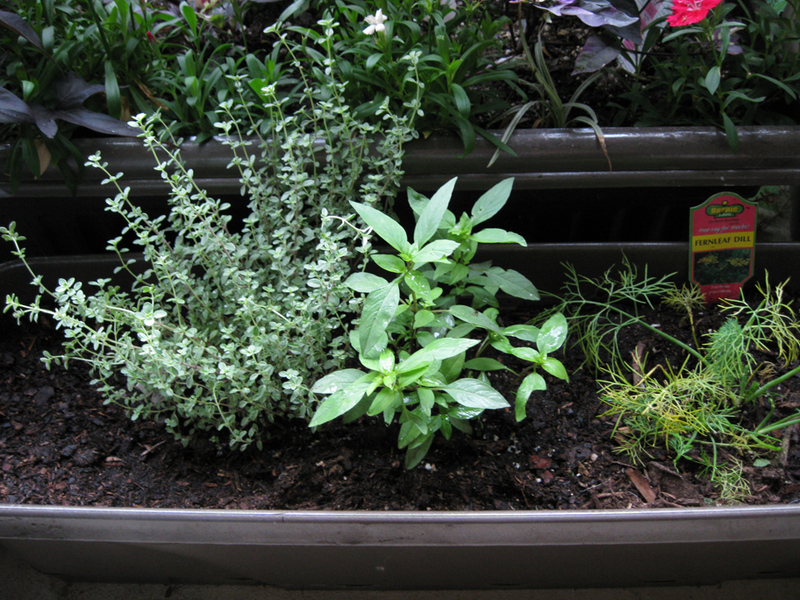 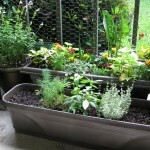 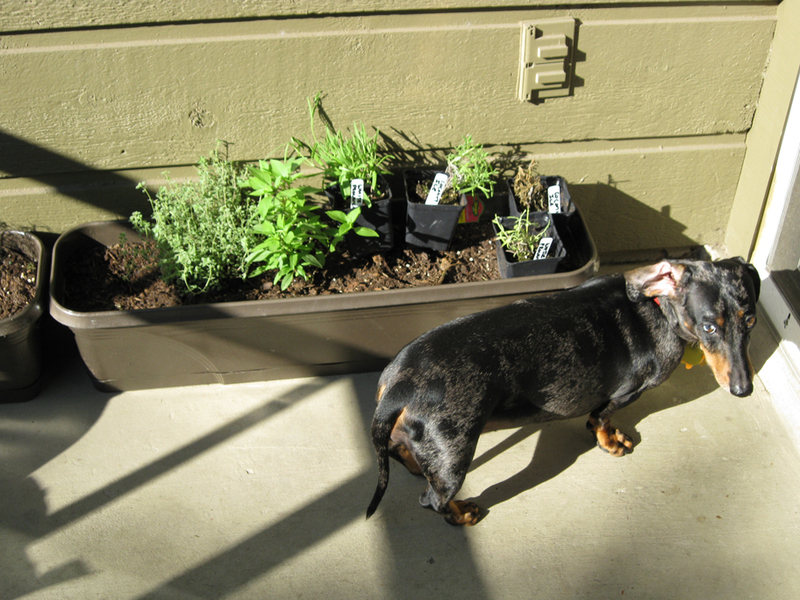 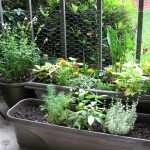 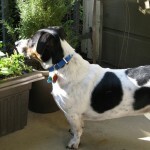 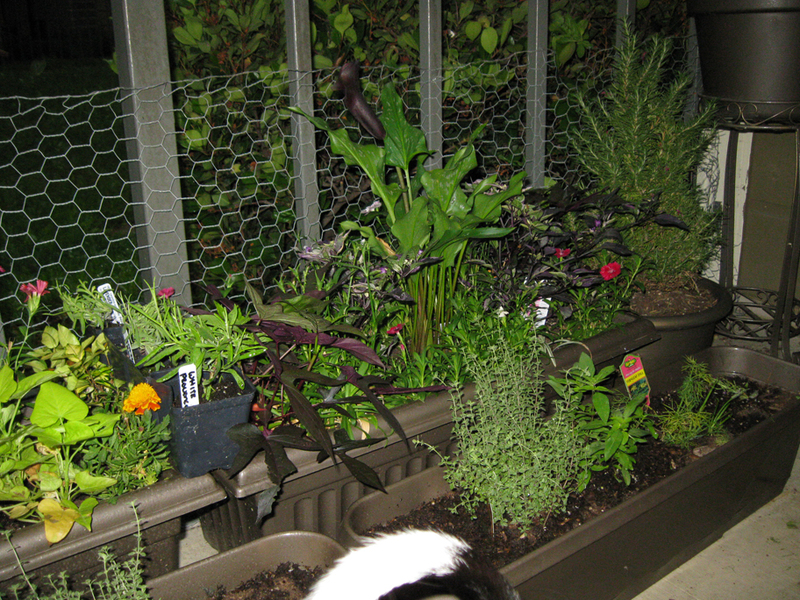 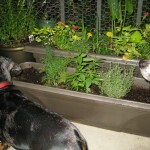 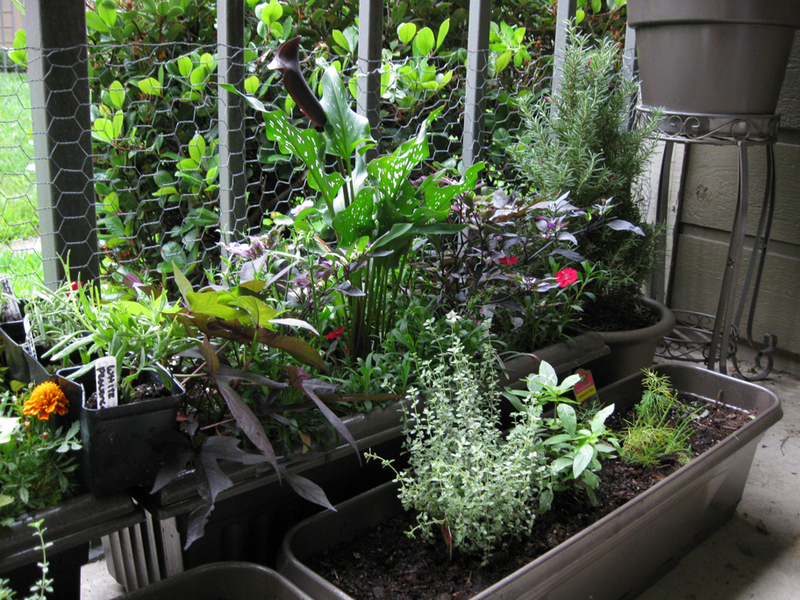 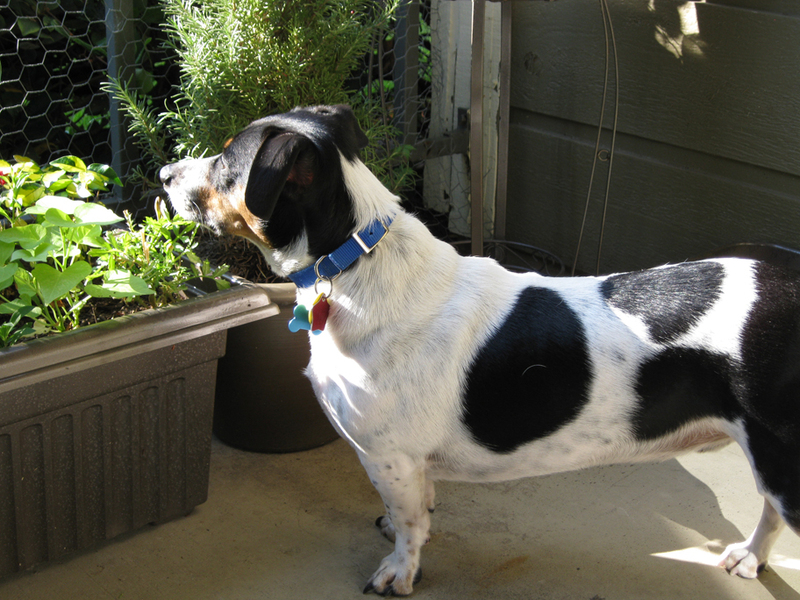 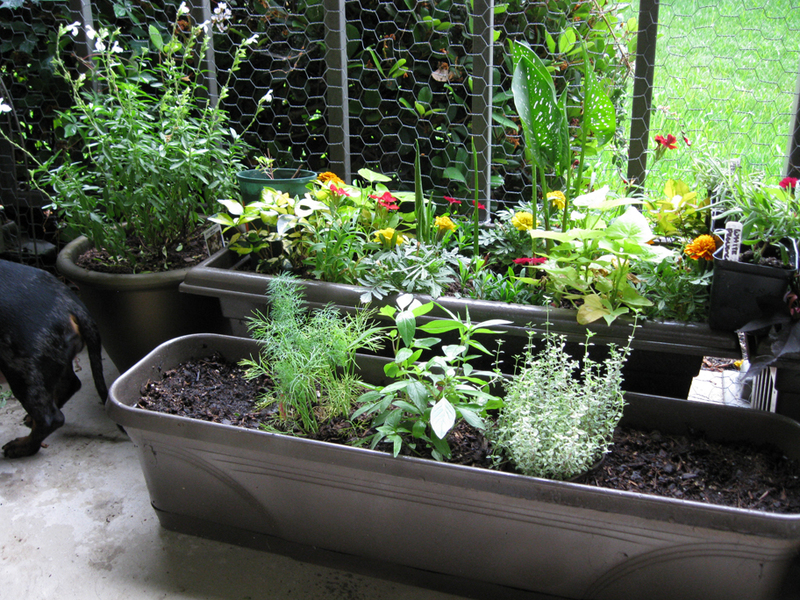 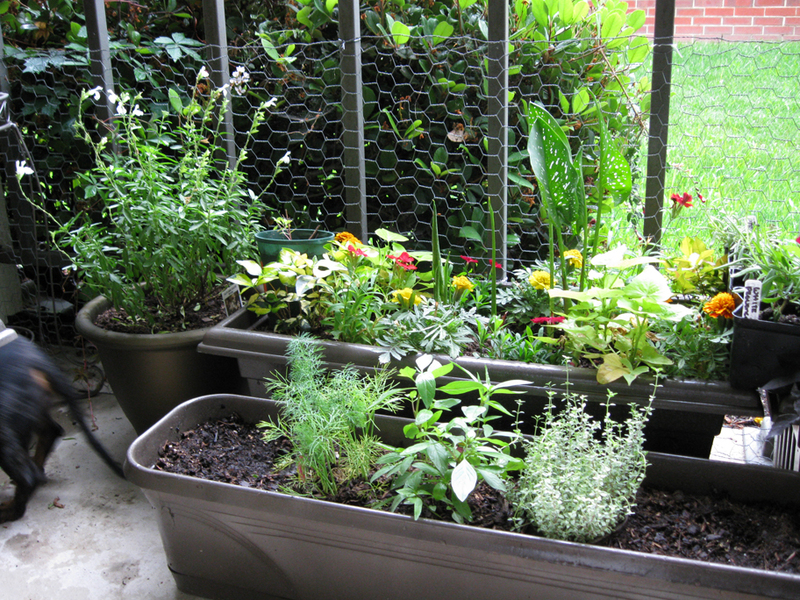 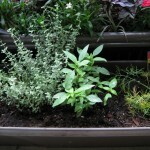 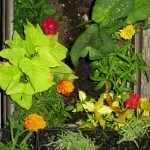 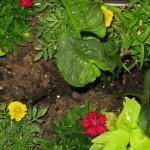 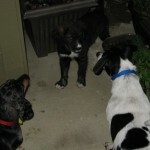 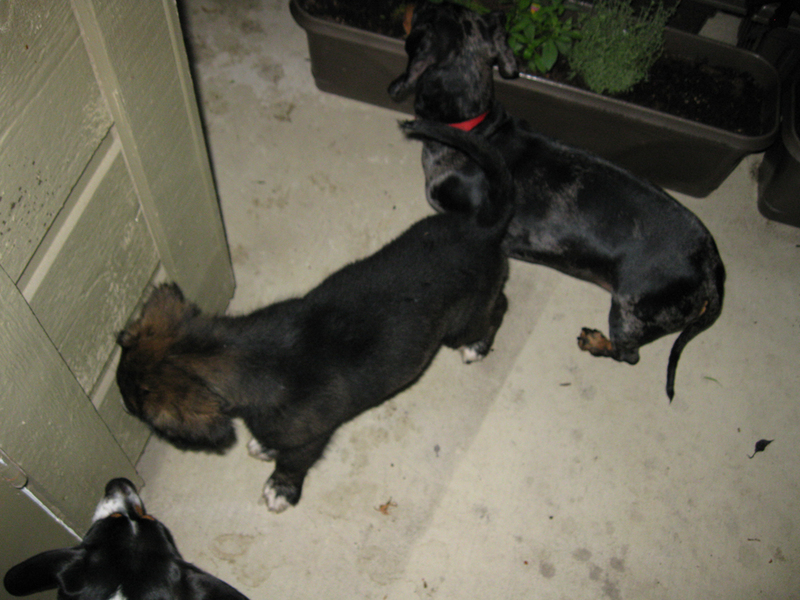 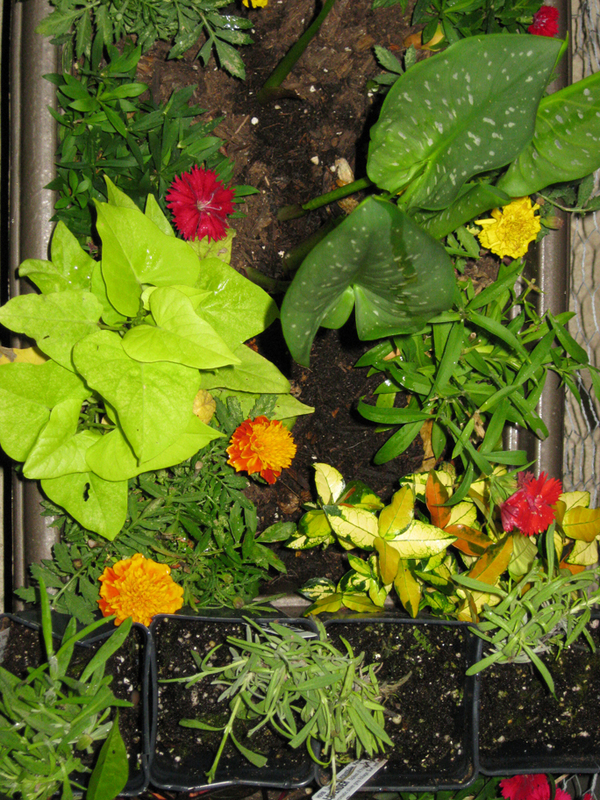 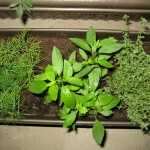 But the photos demonstrate that the herb garden is thriving despite the attention of vegetarian pups.